Wrist pain can be caused by many disorders: tendon entrapment, tendon degeneration, occult ganglion cysts (that are too small to be seen, but still press on nerves or other sensitive structures), fractures, ligament injuries, Triangular Fibrocartilage injuries, Kienbock’s Disease and arthritis. As many of these have been well covered in the sections of this website, this section will focus on Occult Ganglion Cysts. Occult Ganglions are Wrist Ganglions that are too small to be seen or palpated, but press on nerves or other sensitive structures, causing pain. These are most commonly located over the back of the wrist. While Occult Ganglions may cause a steady ache, their pain is usually exacerbated with wrist extension, especially when the wrist is loaded in extension. The wrist is usually tender directly over the Occult Ganglion. Occult Ganglions are best diagnosed by an MRI. Because Occult Ganglions are, by definition, difficult to see or feel, it is difficult to aspirate them with a needle. This can be tried, but usually Occult Ganglion Cysts are either lived with or removed surgically. The surgical excision is exactly the same as for regular ganglions. 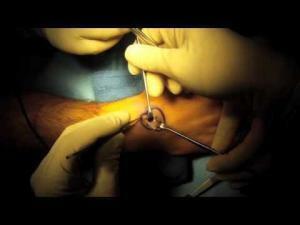 Occult Ganglion Cyst Excision is an outpatient procedure. A small incision is made and the ganglion is removed along with enough joint capsule (the balloon that surrounds the wrist joint) that it can’t reseal, which could lead to a recurrence of the ganglion. Please see the ‘Ganglion Cyst’ section for more information. Following Occult Ganglion Cyst removal, typing and computer use is allowed that night Heavy activities should be avoided for 1-2 weeks to minimize pain and swelling. The wound should be kept clean and dry for 3 days, after which the dressings can be removed and showering is allowed. After showering, the wound can be blotted dry and a Band-Aid placed over the wound. Don’t submerge the wound under water until the stitches are removed, which usually occurs at 2 weeks. Complications are uncommon from Occult Ganglion Cyst removal, except for stiffness, which can occur if motion is not regained following surgery. To prevent stiffness, once the dressings are removed 3 days after surgery, the wrist should be stretched into flexion and extension. This is best done when the body temperature is raised, such as in a hot shower or after jogging, etc. A pulling sensation is often felt during motion exercises; this is normal and nothing to worry about. If full wrist motion has not been regained at the 2 week check-up after surgery, hand therapy will be prescribed. So if wrist pain is bothering you, see a Hand Surgeon to get an accurate diagnosis and learn what your treatment options are.